The mushrooms I picked up at the farmers’ market ended up here. 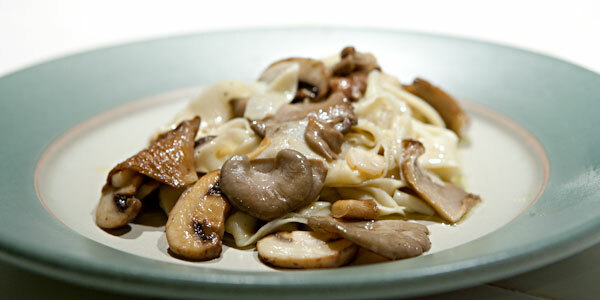 A simple pasta and mushrooms dish that isn’t so simple. 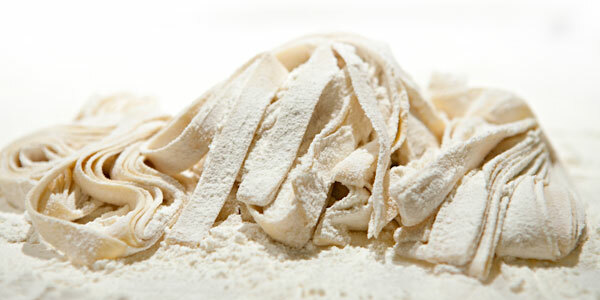 I love fresh pasta, which is a problem. It takes a little more effort than cracking open a box of dried pasta eleven minutes before you need it. 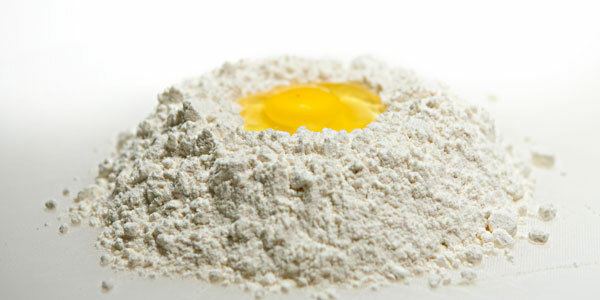 This is where the pasta starts: egg and flour. Can’t get any simpler. Well, I guess a banana is simpler. It even comes with it’s own wrapper. Anyway, pasta is still pretty simple. Lots more pictures of this. Start mixing. I know! Pretty complicated. If you don’t rush it, the mix comes together and you can start working it with your hands into a smooth ball. Yes, your fingers will get sticky. But, it’s a great hand workout. You will develop huge muscles all over your fingers. Let the dough ball rest, wrapped in plastic, for an hour or so to let it relax. Hell, have a glass of wine and relax, too. You just had an incredible hand workout, you deserve a treat. After an hour, it’s time to roll. 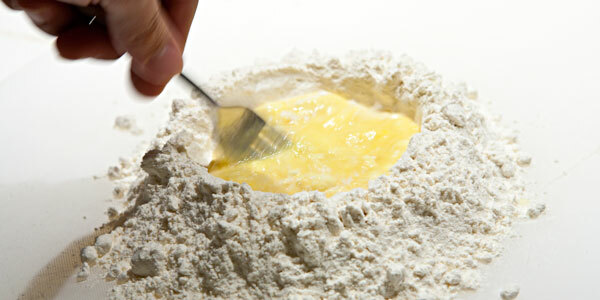 I roll out my pasta with an attachment that fits on the front of my KitchenAide mixer, but you can also use a rolling pin. It should be thin enough to see some light through when you are done. Nice, long, even sheets. 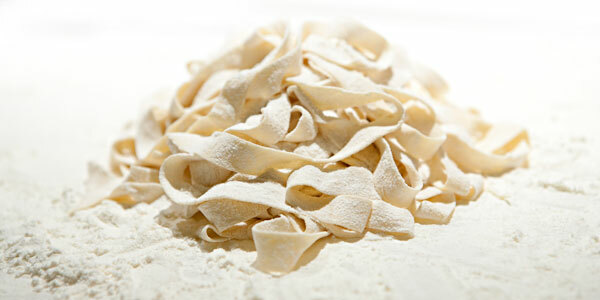 To cut, fold the pasta onto itself repeatedly. Be sure to flour between each fold. Don’t be scared to over-flour the folds. If they stick together because you didn’t flour enough, this was all for naught. Toss your sliced pasta into the air (not too high, you’ll attract cats with all that random movement) to shake the strands apart. You should end up with something like this. Now, get some salted water on boil. 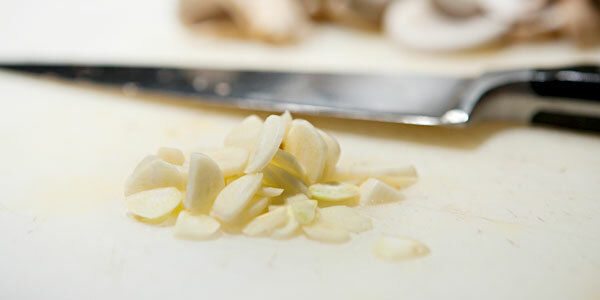 … add some chopped garlic to the mushrooms. 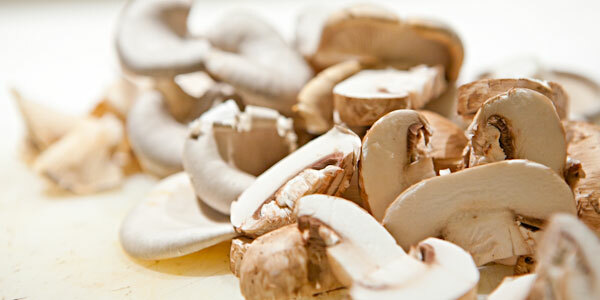 When the pasta is cooked through, add it to the mushrooms and garlic. It will soak up all of that flavor. I love flavor. Flavor is the coolest. You should end up with something resembling this. You, my friend, are a fine cook.